In How to Write Great Copy for the Web, author Donna Spencer will help you start writing content for the web that works! Learn about how writing web copy differs from other forms of writing, and how writing useful, functional and concise copy can both help persuade your readers, and also help with search engine optimization! 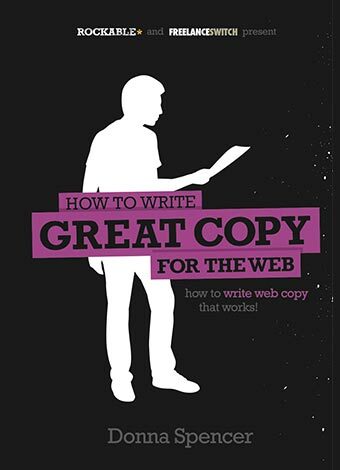 Whether it’s for your own site, or for somebody else, How to Write Great Copy for the Web will quickly bring you up to speed with some clever strategies that will make you popular with your site’s visitors, or with your clients! Website copy is the text that appears on the pages of a website. It can be used to explain, inform, persuade, or entertain – and an experienced web copywriter will use it to do all of these things at some point. What you’ll be using it for depends on your situation. Whether you want to write the copy for your own site, or for somebody else’s, this mini-book will quickly bring you up to speed with some clever strategies that will make you popular with your site’s visitors – or with your clients! How to pass on important information without inducing yawns. How to grab a reader’s attention and keep it. How to write web copy that stays true to your branding – or your client’s branding. How to persuade readers to do what you – or your clients – want them to do. How to use web copy to sell products and services. If you’re a designer, you may have had a client ask you to write the copy for the website you just designed. In the past you might have refused – after all, you’re a designer, not a copywriter! But by saying no to these jobs, you miss the chance to earn more money for your work. This mini-book will give you all the know-how you need to comfortably take on these jobs, create more billable hours and impress your clients! If you’re creating your own website – whether for a company, personal project or a blog – you’ve made a smart choice by purchasing this mini-book. The skills you’ll learn will help you communicate your site’s purpose to its visitors. If you want to persuade visitors to do something – whether it’s buying from you or supporting a cause – then you’ll need to be persuasive. Luckily, we’re about to teach you how to do just that.